The site camoin.com has changed! You will find early tarot decks which have never before been shown on the Internet. An introduction to the Secret Codes of the Tarot, which were revealed for the first time in 1999 by Philippe Camoin. An introduction to the Philippe Camoin Method of Reading with its rules and its laws. Several examples of readings for beginning and advanced readers. 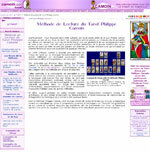 A Forum is available on which you can ask questions about the Tarot de Marseille. A private section is provided for students and graduates to meet each other, exchange information and deepen their understanding. The Magazine is back, with many different new articles discussing symbolism, the history of Tarot, religions, and more!